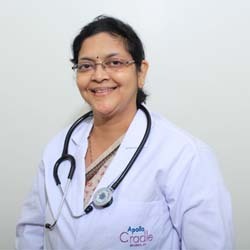 She is a practicing Senior Consultant Gynecologist, Laparoscopic & Robotic Surgeon for the last 20 years, Honorary Associate Professor, AHERF, Lead Faculty, DNB Obstetrics and Gynecology Teaching Program. She was awarded the prestigious FIGO fellowship in the year 2000 for her paper ‘Vaginal Hysterectomy for the Undescended Uterus (NDVH) – Analysis of Factors Predicting Feasibility’. Best paper award at the North Zone Young FOGSI Conference at Agra 2001. AOFOG young gynecologist award to attend the Asia Oceania Federation Conference 2002 to present work on HYSTEROSCOPY. Delivered two lectures on “Rectus Fascia Sling for Incontinence” and “How to choose the route of hysterectomy in DUB” at Asian congress on Controversies in Obstetrics, Gynecology and infertility at Bangkok, November 2004. Dr. Rooma has more than 20 papers published in national & international journals. She has EDITED A TEXTBOOK ON UPDATE IN OBSTETRICS AND GYNECOLOGY, 2011. She has contributed more than 15 chapters in various postgraduate text books. Some of her publications in the last 5 years are mentioned below Sinha R, Madhumati S, Rupa B, Shamita Kumari. Tips and Tricks in Robotic Myomectomy, Apollo Medical Journal (AMJ); September 2014, Volume 11, Issue 3, 174-178. Sinha S, Sinha R. Excision of urethral diverticulumin a 24 year old woman. GUEST EDITOR OF APOLLO MEDICAL JOURNAL issue on Recent Advances Obstetrics & Gynecology September 2012 issue Sudha A, Vivekananda N, Sinha R, Bharadwaj N. Acardia fetus: Incidentally discovered placental mass. J Evol Med and Dent Sci, 2013: 22 Sinha R. Hypertension during pregnancy.